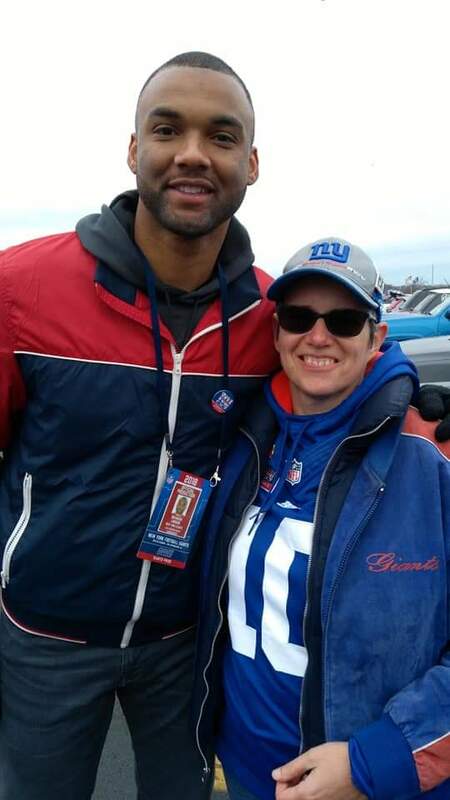 As part of our series in celebrating female NFL fans across the UK, I’d like to introduce you to Vicky Archer, a New York Giants fan. Vicky shares with us how she got in to the NFL, how she made the choice of her team as well as more about her overall experience as a fan. My NFL journey started as a teenager back in the 1980s. Back when TV meant 4 channels, remember sky TV was still many years away, no internet,so no online shopping for merchandise, no websites, no blogs or Twitter. It’s 1989 and I’m 14 when I discover this slightly puzzling but exciting sport on Channel 4. Men the size of giants dressed in armour battling against each other in a game of brute force and strategy. Learning the rules was a slow process… remember no internet, but little by little it began to make sense. Once I found my sport I needed to pick a team but which one, this was the era of many excellent NFL players. San Francisco 49ers had the great Joe Montana at quarterback and the Miami Dolphins had Dan Marino. The Chicago Bears had William Perry aka “The Fridge” how cool was that nickname. For me my team was going to have to be from a city that to me symbolised America…New York, towering buildings of great achievements, the city that never sleeps, full of landmarks that even a teenager from England could recognise having seen them on her TV in numerous films and TV programs. So that left me 2 choices the Giants or the Jets, but in reality only one as the Giants featured on channel 4 much more than the Jets, and also my favourite colour is blue so my decision was made. Next the 1990 season and I had high hopes that we were going to build on the performance from the previous season, all was looking good our quarterback Phil Simms was having an amazing season we were 11-3 when disaster struck he broke his foot in the game against the Buffalo Bills which meant Jeff Hosteler had to step up, a relatively unknown quarterback had some big shoes to fill. Thankfully he didn’t let us down and we finished the regular season with another 2 wins, the Giants were going to the playoffs again. I remember the playoffs as a nail biting time for me involving some last second field goal attempts and also a tiring time as I stayed up to watch both the NFC championship game and the Superbowl live and still went to school after just a couple of hours sleep. After that thrilling season I was hooked and a Big Blue supporter for life. To watch some live NFL I dragged my dad to Wembley in 1991 to watch the Philadelphia Eagles play the Buffalo Bills in a pre season game, I enjoyed the game while he listened to cricket on a pocket radio unfortunately he didn’t share my love or understanding of the game. 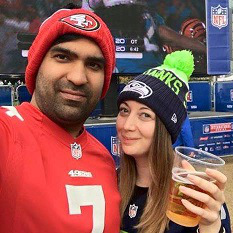 Thanks to the NFL international series I got to see my team play live at Wembley…and win what an amazing experience, and then again at Twickenham and another win, including meeting up with fellow Giants fans and super fan LPG Joe Ruback. I have also made the trip to the MetLife stadium twice to experience a home game, the last being part of an unplanned UK Giants trip which saw over a dozen of the UK fan group fly out for the same game, tailgating with fellow US fans, and going on the field after the game which is and always will be one of those heart stopping moments. The likes of eBay, Amazon and NFL shop have enabled me to build my collection of New York Giants memorabilia to the extent that not a Christmas or birthday goes by without another item being added to the collection, some even say I have an obsession but I just say you can never have enough Giants stuff. 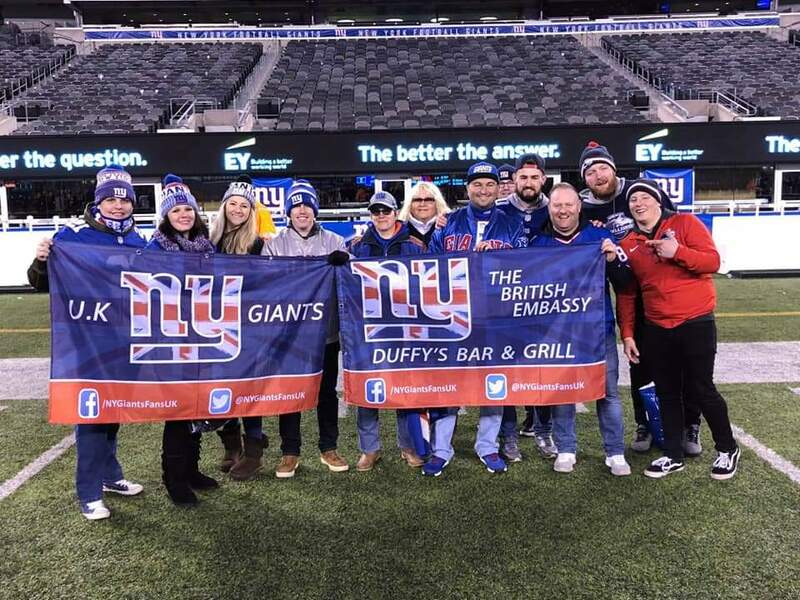 I must give a shout out to the New York Giants Fans UK Facebook group @NYGiantsFansUK, an amazing group of fans, a place where we can interact with fellow fans and where I have made some fantastic friends, with special thanks to Keith Burton and Andi Robinson for all their hard work. I’m looking forward to watching the game grow in the UK and hoping the Giants get back to winning form soon, but win or lose I’ll support my team……Let’s go Giants.